Composition: lactose, EVO- Chlorophyll, vitamins В2, В4. One capsule contains 8,5 mg of WSH. Total WSH content in one 60 capsules pack – 510 mg. Directions for use – 2 capsules a day. EVO – Chlorophyll P (раствор) flask 100 ml. Composition: Cleaned water, EVO- Chlorophyll, lecithin, apple pectine, maltodextrin, potassium sorbate. WSH content – 340 mg in 100 ml. flask, in a 5 ml daily dose – 17 mg. Composition: cocoa oil, EVO- Chlorophyll. WSH content in one candle– 25 mg, 250 mg. in a pack. The unique advantage of these products is the use of liposomal chlorophyll form. It ensures high absorbability, assimilability, stability and precise transportation to target cells. Saturate tissues with oxygen, restore PH balance. Products are recommended for correction of the functional activity of main organs and systems in the organism, prophylaxis, auxiliary therapy. Intake course in prophylaxis purposes is designed for 3-4 months. In case of presence of multiple chronic conditions, at oncology processes doctors consultation is needed with the development of the individual intake program. Result may depend from the duration of the EVO – Chlorophyll intake, patient's weight, age and presence of chronic diseases. Products are absolutely non-toxic, do not cause dependence, and compatible with all medicines and procedures. EVO – Chlorophyll aids 30-40 % rise of the absolute quantity of immune cells, considerably increasing their activity. With its help our immune system self-restores and starts to fight with chronic diseases on its own, directing immune-competent cells at their targets: T-killers at timorous cells, leucocytes at inflammatory processes, macrophages at pathologically modified cells, and so on. Due to specific properties of Water Soluble Chlorophyll (WSH), products are effective for fighting atherosclerosis, ischemic heart disease, violations in brain circulation, diabetes. Organism energy level increases during preparation intake, normal activity of organs and tissues restores, general rejuvenation is taking place. Every human being in any age is thinking about preserving good health, ability to work, activity, energy. At that negative influence of the aggressive environment only strengthens with every year. Along with ecology, economy and social stresses, organism is subjected to pernicious influence of ionizing irradiation, anoxaemia –hypoxia, it is especially actual to those who are living in big cities. Is it possible to decrease risks of aggressive environment influence at the organism? With what and how is it possible to improve the state of health and avoid tedious visits to drugstores? New trend in medicine – endoecology – gives an answer to this questions. It is a discipline about internal medium purity. Products with the new active substance EVO-Chlorophyll, oatented by the Center Region Company, will be the means of achieving this objective. “Chlorophyll grain is an initial point of everything, what we imply under the term of “life” – wrote Russian academician K. A. Timiryasiev in his book “Sun, life and chlorophyll” in 1948. Why prominent scientist of the 20-th century devoted numerous research jobs exactly to chlorophyll ? Why did he gave such a tremendous significance to this substance? Chlorophyll is derived from the Greek words χλωρός – «green» и φύλλον – «leaf» - green pigment, which paints plants in green color. It takes place in photosynthesis process. World medical community highly appreciated discoveries, connected with Chlorophyll. Richard Martin Willstätter received in 1915 a Noble Prize for “Discovering the chlorophyll formula”. In 1930 Hans Fischer received Nobel Prize, who hemoglobin discovered chemical structure, the main respiratory blood pigment and discovered that it is almost identical to chlorophyll. Functional chlorophyll properties are similar to blood hemoglobin properties, that’s why scientists call chlorophyll “the blood of the plants”. Hartmut Michel received Nobel Prize in 1988 for ascertainment of 3D structure of chlorophyll photosynthetic reaction center. Numerous scientific researches show that hardly ever some diseases exist, at which patient’s health could not be improved with the help of chlorophyll. Most fullestly chlorophyll-containing preparation was tested in Hematology scientific center of Russian Academy of Medical Science. Numerous clinical tests, that confirm chlorophyll effectiveness for prophylaxis of skin, oncology and many other diseases. Oncoprotective chlorophyll properties are of great interest. It is proved that chlorophyll may suppress mutagenous activity of carcinogens, that leads to cancer development, more than by 90 percent. It is the highest value among all known biologically active supplements. Chlorophyll absorbability problem and ways of solution. Chlorophyll absorbability in human organism is not high and depends on numerous factors. The use of liposomal technologies is one of the ways of this problem solution. Ability of precise transportation, high absorbability and assimilability are advantages of liposomal technologies, along with stability, long shelf life and possibility of precise dosage. Several ways for health restoration and prophylaxis will be realized in this line of products: saturation of tissues with oxygen, restoration of acid-base balance, deducing of toxic substance out of the organism and activation of the immune competent cells. 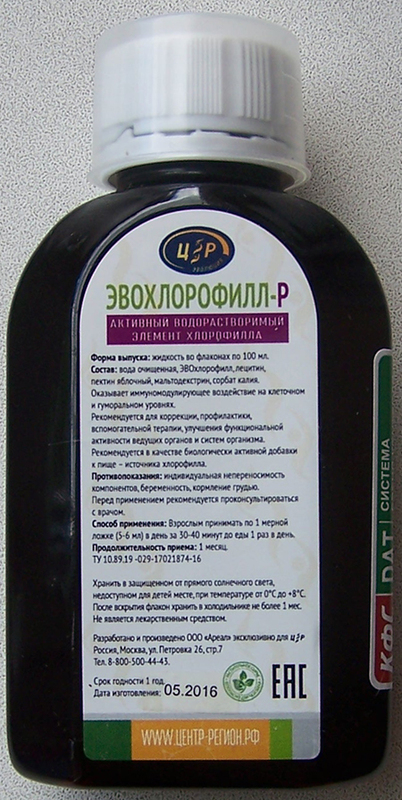 EVO-Chlorophyll is recommended for diseases prophylaxis and correction of main organism systems and organs. The main advantage of active EVO-Chlorophyll substance is that liposomal form is used as a carrier of the main active molecule. It ensures good assimilability, absorbability, stability, and good transportation to the target cells. Other companies do not have liposomal form of chlorophyll. Prophylaxis course of EVO-Chlorophyll use is three months. One shell start from EVO – Chlorophyll P (раствор) – solution, from 3-5 drops a day, daily, 40 minutes before meal, gradually increasing the dosage by 1-2 drops, bringing the amount to the volume of one teaspoon a day. Two flasks are needed for a course. Then, without a break, one shell take capsules - EVO – Chlorophyll K (капсулы), 2 capsules a day, mornings and evenings, 40 minutes before meal. One pack is needed for a month course. Next, without a break, one should start a month course of EVO – Chlorophyll C (свечи) – candles. One candle a day. Three packs (10 candles in a pack) are needed for a course. After 1-2 months break, the prophylaxis course should be repeated. In order to correct in complex therapy already acquired diseases, individual course scheme should be designed with a specialist. Contra-indications for the chlorophyll intake are: pregnancy, breast-feeding and also diseases in acute stage. Side effects were not found in the available medical literature. Idiosyncrasy at the intake of these products is met very seldom.